All parents want their children to model good character. And the best way to do that is to encourage children to want to be just like our ultimate role model―Jesus! 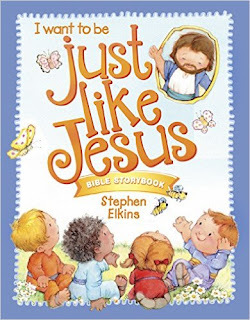 Just Like Jesus Bible Storybook is a collection of stories that will inspire kids to take on the character of Jesus. Each story highlights a lesson that Jesus taught―lessons like giving thanks, treating everyone equally, sharing with others, being patient, being generous, and more. Each lesson features a “Jesus in the Bible” story that shows Jesus’ character and how He acted in particular situations. Flip the page, and children will find a section called “Jesus in Me” that will inspire them to model Jesus’s behavior, conform to His character, and want to be just like Him! Each lesson ends with a short prayer through which children can ask God to help them develop the character of Jesus. Just Like Jesus Bible Storybook by Stephen Elkins is such a wonderfully cute book! I love that this book is filled with stories that inspire kids to be more like Jesus. It teaches kids how Jesus acted in particular situations and inspires children to model His behavior. At the end of each lesson there's a short prayer for children to help them develop the character of Jesus. My kids really enjoy reading this book before bed and the prayers at the end of each lesson are the perfect way to end the day. The illustrations in this book are cute and my children love flipping through it and looking at the cute illustrations. The illustrations also help my kids to remember which lessons are their favorites and often pick them out as we are getting ready for bed. My family and I really enjoyed this book and it would perfect for anyone with little kids. by Stephen Elkins on Amazon, Barnes and Noble and other bookstores.